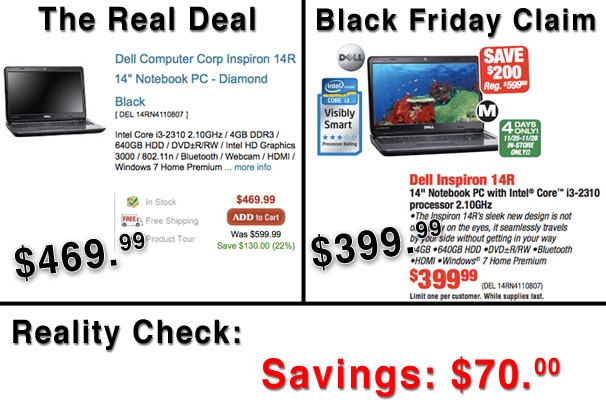 Not all Black Friday sales are what they appear to be. 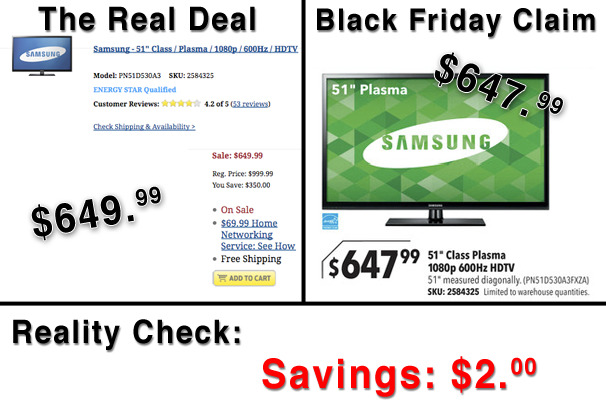 Here's a look at 10 Black Friday doorbuster deals that stink. Black Friday has arrived, but if you're reading this chances are you decided to forego the deal hunting and stay home to turn that leftover turkey into soup and sandwiches. You'll certainly miss out on a few good deals today (you can find a list of some of the better Black Friday deals here), but not all Black Friday sales are what they appear to be. Here's a look at 10 stinky Black Friday doorbuster deals that include jacked-up prices, misleading savings promises, and sale prices that aren't really sale prices at all. 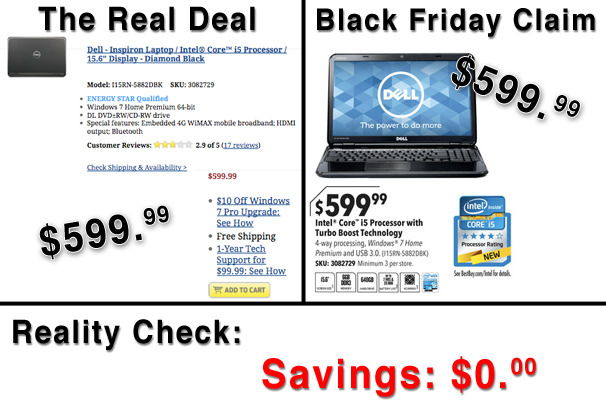 Best Buy's Black Friday doorbuster sale included a number of laptops that had zero savings compared to prices earlier in the month such as this Dell laptop with a Core i5 processor. Best Buy is promising a minimum of three units per store for this model to deal with the holiday rush, but it's hardly worth braving the crowds for this deal. What an incredible deal! 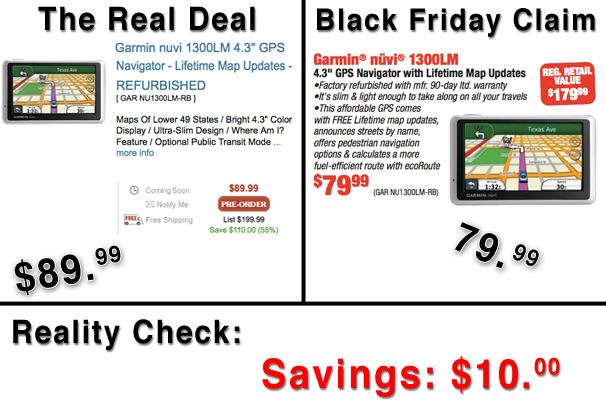 This Garmin Nuvi GPS device has a regular retail value of $179.99, and that suggests J&R's Black Friday price will save you $100. The only problem is this unit was just $89.99 about a week ago, meaning you save $10, not $100 after the price cut. 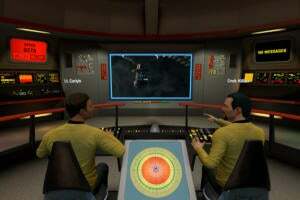 PS3 fans might be clicking away on Amazon today to get this hot game for about $45. 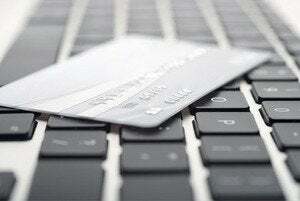 Amazon says its Black Friday price will save you $15 off the list price. That may be true, but if you'd bought the same game as recently as last weekend, you would've spent only an extra $2.01 compared to the Black Friday price. Anyone who buys this item today still saves five dollars off Apple's list price. 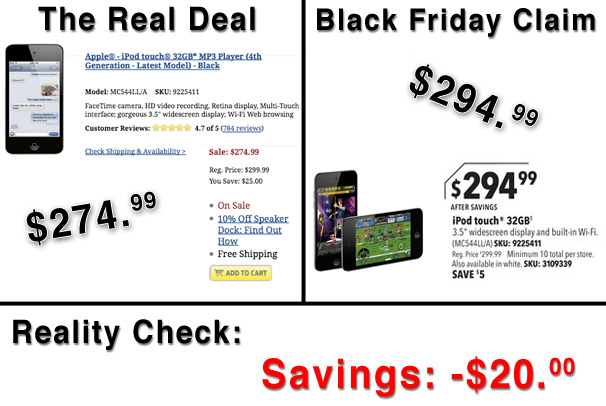 Too bad Best Buy's price for this iPod actually went up on Black Friday. At least the first 10 shoppers got a free $50 Best Buy gift card, so this deal wasn't all bad for them. But if you head to Best Buy later today, don't bother buying an iPod Touch there since Apple is selling the same device online for $178. Best Buy's pricing for the 8GB iPod Touch was bad enough (see previous slide), although the free gift card for the first 10 buyers made things better if you got in early enough. But this 32GB iPod Touch sold for $20 less just a few days ago. 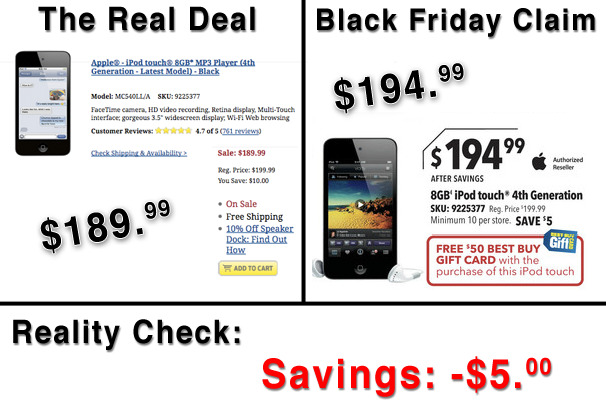 To make this deal look even worse, Apple's Black Friday price for a 32GB iPod Touch is $268, about $27 cheaper than Best Buy's Black Friday price. 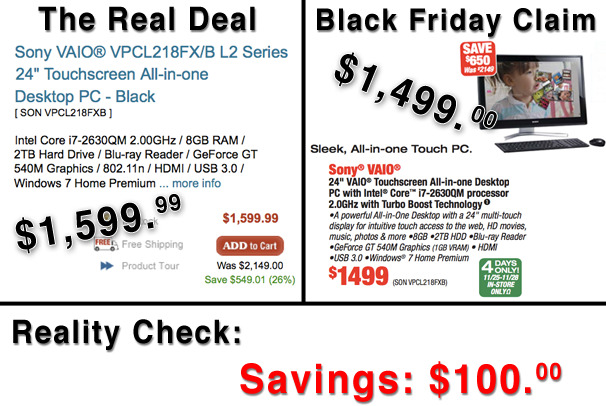 This Sony Vaio All-in-One desktop was supposed to be a steal at $1499 since J&R says it was priced $2149. But when was did it sell for this higher price exactly? Last January? 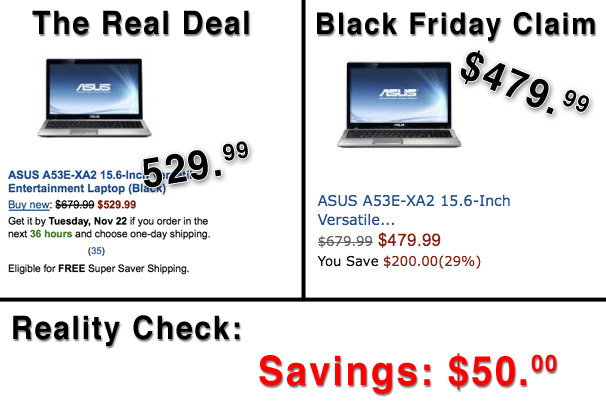 Because in mid-November, J&R was selling the desktop for $1599. Imagine: You had your heart set on this 51-inch monster, and you waited outside Thursday night in the freezing cold just to get in on this deal. 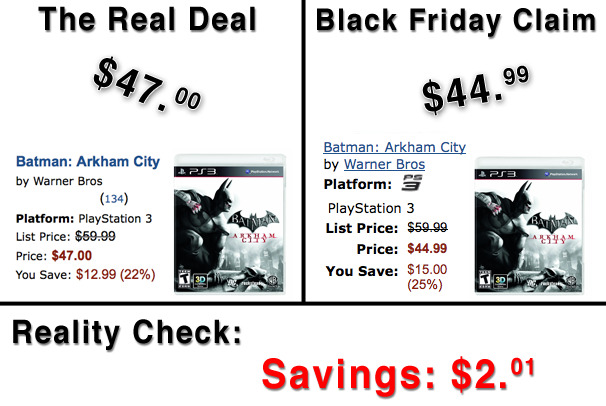 I guess you should've stayed home, because all you saved compared to earlier pricing at Best Buy was a measly two bucks. 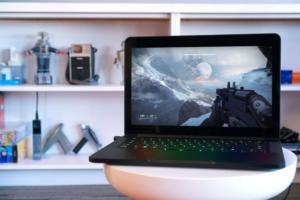 Amazon says you'll save $200 if you buy this laptop today. 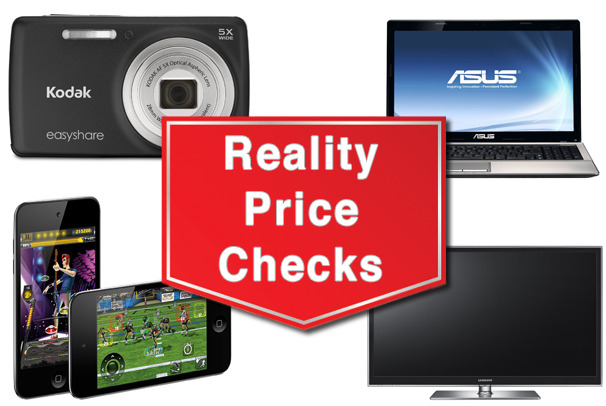 But the truth is this computer is only $50 cheaper than pricing earlier this month. You'll still save, just not as much as you think. 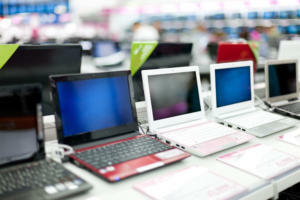 Yes it's still a deal, but J&R says you'll save $200 if you buy this laptop today. The only problem is that, earlier this month, the retailer priced this for just $70 more. 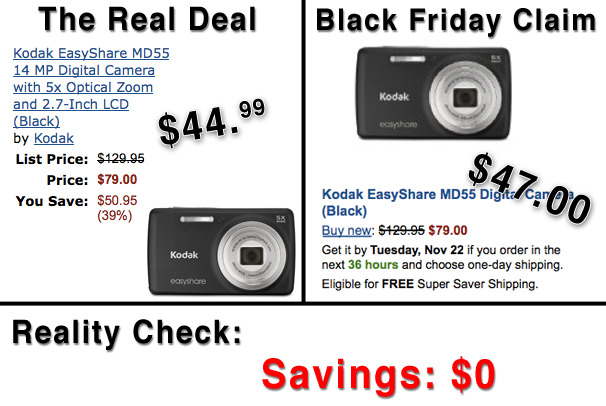 Wow, if you buy this point-and-shoot at the Black Friday price, you'll save $50.95 off the list price. That's a nearly 39 percent savings, isn't it? Not really. This camera was selling for the exact same price less than a week ago.